Not gonna lie, it’s been a heavy week. Or really, a heavy year and it’s not all done yet. It’s ok, I’m resilient and I have fantastic friends and family members that provide much-needed support. I also have an incredibly healthy and active fantasy life that sees me through the toughest times admirably. Recently, as I have not only alluded to but been fairly explicit about, that fantasy life has focused almost entirely on Highlight and specifically on Yong Jun Hyung. I won’t go into details and I certainly won’t wax on about it endlessly (unless you ask really nicely and then I won’t be able to stop myself). But please allow me one more Highlight post this year. When I fall crazy in love with an artist or a group, one of the consequences is that I don’t really want to talk about their new stuff to anyone other than my nearest and dearest. And that group gets smaller and smaller as I fall deeper and deeper. I’m not sure if it’s because it just feels too personal and intimate or if I’m afraid that my assessment will be incredibly biased and I’m going to boast a love for something that is actually just crap. So when I was preparing to do today’s post, I almost immediately tabled Highlight’s latest EP, Outro, and the title track Loved. I was toying with a few other songs recently added to my ever-evolving soundtrack but I couldn’t really settle. So when Alix jokingly said that I should just do her for the post, I realized that I was being silly and that she was right. I SHOULD just do her. Or rather, I should do the thing that we are now (again) obsessing over together because it really is good and everyone should be listening to it. Besides, if you didn’t want to hear about this masterpiece, you should have offered to do this week’s Musical Monday in my stead. I’ve been incredibly busy and would have jumped at the chance to have you step in. Here’s the skinny, and I’m doing my absolute best to remain objective, the whole EP is a delight. We all know that Yoo Doo Joon, Highlights illustrious leader and much-beloved favorite to my dear, sweet KB, went off to the military on incredibly short notice, in the middle of a drama and while in the beginning stages of preparing for the group’s comeback. Super crap timing, Korean Military, super crap. BUT, while he doesn’t appear on any of the other tracks, he does have a solo song on the EP, Nightmare. It’s a real treat. Fans missed him so much that they’ve done a full series of photo edits adding him to the promos for this comeback…see the header of this post for one of my favs. Google it too, they are hilarious. The EP is actually a goodbye to fans before the remaining four members of Highlight enlist in the coming months. 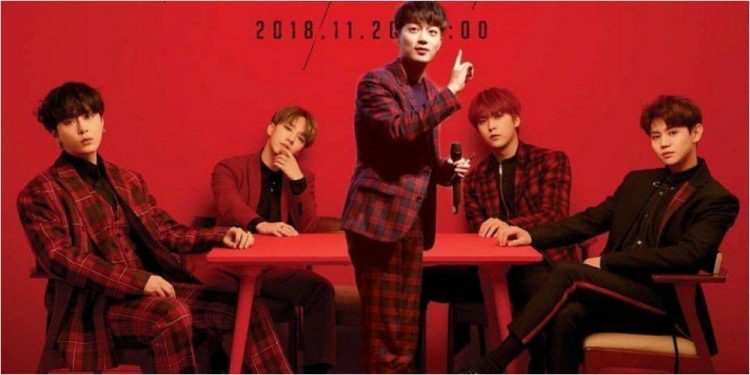 It contains the title track and DJ’s solo along with a duet featuring Yang Yoseob and Son Dongwoon written by Yoseob and another with Jun Hyung and Lee Gikwang written, of course, by Jun Hyung. With the exception of Yoseob’s song, Jun Hyung and his writing partner, under their name Good Life, did all of the tracks. Loved is very reminiscent of the darker, dramatic music the group did in their pre-Highlight days. Even the video reminds me more of Beast than it does of the last year or so. I’m obviously not complaining. I love Beast with nearly the intensity I love Highlight. And yes, I do remember that they are actually the same people, but the music is pretty different between the two groups. Beast has an alarming number dead or heavily sleeping females in their videos while Highlight has a lot more raucous grocery shopping and work days at the laundromat. They are super different. I’m not wrong. While I was predestined to love this song and this EP with the passion of ten thousand fiery suns, I think I’m actually right in doing so. I admit that Calling You was a superior album to my sensibilities, but I’m not above buying both Versions of Outro when KpopontheDL asks me what I want from the Kpop store in the coming weeks. Also, I know a good quarter of the over 1.5 million views on Youtube are from Alix having it on repeat since it came out. She doesn’t hit play over and over and over for just anything. I guess that this means that this time, despite my deep love, I’m sharing the new stuff with you all. Please don’t tell me if you don’t like it. I really don’t want to know.